I had a long weekend full of exercise. 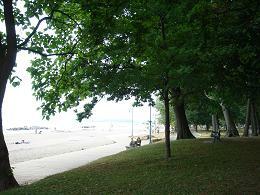 On Saturday, I inlne skated along the Hamilton beaches for 18km. Then on Sunday, I met with the Toronto Trailbladers at Port Credit and we skated along the Waterfront Trail eastward past Marie Curtis Park for 25km. I have never attempted such a long trail before! Fortunately, I was able to keep up without any issues. Who knows, may be there's hope for me to get a flat stomach before end of this year. Victory surely tastes sweet. 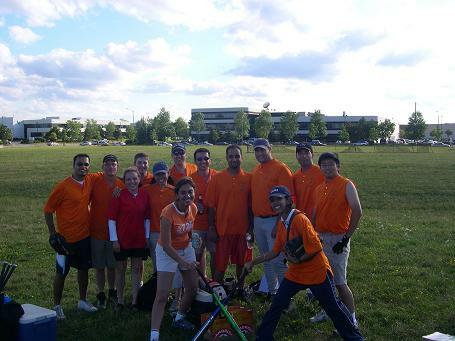 After many games this season, our softball team finally has our first win (18-5)! We played well both offensively and defensively. Most notably, we had an inning with 6 runs and another with 7 runs. My poor blistered hand didn't hurt too much but I opted for the 26oz bat instead of the 27oz one that I normally use. To make things even sweeter, my batting practice from Monday is starting to pay off. I managed to hit the ball using the barrel part of the bat finally but the bittersweet part was that it was an infield fly ball so I was out automatically. I think our team has something really good going on. Who knows, perhaps we're on our path to taste the fruit of labour! I'm sure all those practice sessions are not for nothing. My shoulders are sore because I've been batting a lot in today's practice. I still cannot get my front foot to step out correctly. For some reason, I want to get closer to the ball when it hits the bat. However, that's exactly what I should not do because the ball would end up making contact too close to my hands. That's terribly inefficient and the ball wouldn't go very far. I must have swung 50 times! It was a fun practice until the end when each of us had to hit three times at bat. Since we were close to the end of the practice, when it was my turn, I did not take the time to put on my batting glove. Lo and behold, after only five swings, I developed and ripped a huge blister on my left palm. Ouch! I went to Vaughn Mills mall today for some relaxing indoor exercise (i.e. 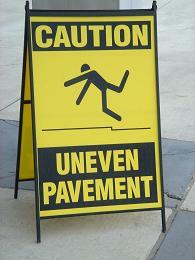 strolling in a mall) and came across this funny sign at one of the entrances. I love stick figures. It's been swethering hot for the entire week and all I wanted was something really refreshing. What can be more refreshing than summer melons? I've decided pretty early on that I want to feature a medley of melons for one of the desserts this month. A favourite summer fruit of mine is cherries. In fact, I look forward to July every year because of all the different cherry desserts that I can indulge in. Sorbet of Summer Melons: a medley of four different summer melon sorbet served with coconut honeydew sauce and lemon tuile. Cherry Clafoutis with Pistachio Mousse: cherry clafoutis served with pistachio mousse, mascarpone amaretto cream, and cherries marinated in kirsch. I don't think the description of the melon sorbet did it justice because it looked so amazing (I really don't shy away from bragging, don't I?). I used a ring mold to set four layers of melon sorbet (orange, white, red, green). On top of the sorbet, I used tiny cubes of the melon to hold a piece of lacy lemon tuile upright. 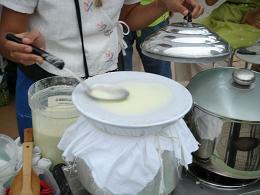 The sauce was dotted with tiny pearls of tapioca and star-shaped honeydew melon pieces. The presentation looked so whimsical. The cherry clafoutis baked up quite nicely in individual sizes. I also liked the pistachio mousse although I think the texture could be more delicate. One unexpected thing did happen with the mascarpone cream though. My original idea was to serve the cream on top of a round of hazelnut sable and stud the cream with the marinated cherries. Unfortunately, when I tried to pick up the sable from the baking tray, they all fell apart on me. That was really too bad because without the sable, the cream with cherries looked a little odd on the plate. Since I only could make a limited number of the summer melon sorbet, I decided to bring along the coconut honeydew tapioca dessert soup just in case. This is a dessert soup that my mom used to make in the summer and it just brings back so much nice memories. I made a huge batch on Saturday and I thought that it would be great to share it at the staff meal. The dessert soup is a blend of coconut milk, evaporated milk, honeydew melon puree, simple syrup, melon liqueur, tapioca, grass jelly, and honeydew melon pieces. Just to make it more fun, I cut the melon pieces using a star-shaped cookie cutter. Once I ran out of the melon sorbet, I served the dessert soup in a martini glass with a quenelle of honeydew melon sorbet and a couple pieces of the lemon tuile. The pale green colour of the soup looked so inviting in hot summer evening. We sold out early in the evening. What a great feeling of accomplishment! I stumble upon the website of Toronto Trailbladers when I was looking for trail maps a few days ago. This is an inline skating club that meets twice a week for inline skating at trails in and around the Greater Toronto Area. I think it would be a great way to try new trails so I went to their Wednesday night rolls last evening. We met at the Etienne Brules Park in the Jane & Bloor area and bladed along the Humber River Valley Trail. There were quite a few hills and a bridge with speed bumps every few meters so it was not an easy beginner trails. Once we started blading, the group splitted into a faster and a slower group. I couldn't keep up with the fast group so I toke it easy and bladed in the slower group. After we reached the half-way mark, I think everyone slowed down as I was able to keep up with the fast group. The people are friendly and it's great to find out more about inline skating activities around Toronto. Turns out we do have a Friday nigth skate at Bloor & Yonge! 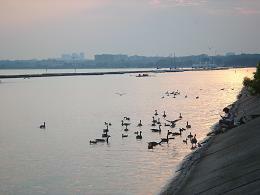 I'll try to make it to this weeks Sunday roll at Port Credit. I wonder if I have the stamina to blade for 3 hours? This would be a first for me! I had quite a busy day. I went to a farewell lunch, doctor's appointment, played in two back-to-back softball games, and baked a blueberry pie. I was originally scheduled to play only in the 6:40 game but S called me up in the afternoon and asked me to play for our other team at the 5:30 game because that team did not have enough girls for the game. On my way to the early game, I was certain that I couldn't get there before the end of the first inning but turned out I was there just in the nick of time. Fortunately, I played pretty decently for the other team so I didn't embarrassed myself too badly. When the second game began, I was a little tired but felt sufficiently warmed up to play a good game. In one of the innings, the other team had already scored 6 runs, one out, and bases were fully loaded. B told me that he would throw the ball at me at the home plate. Lo and behold, I caught the ball securely in my glove just as the guy was running towards the home base! I was ecstatic that I got him out. I also managed to get on base every time that I was at bat. I hope that my recent successes in softball are not a fluke but real improvement. My blueberry pie just came out of the oven and it smells absolutely devine. Every year I love to buy baskets of wild blueberries at the farmer's market and they are destined to become blueberry pies and blueberry pies only. The flavourful wild blueberries are so much better than the cultured ones. This delicious pie is one of those few things that I only share with the very special people in my life. Have I treated you to a slice of my blueberry pie before? I've been looking forward to wander around downtown Toronto since the beginning of this week so I've done just that today. First stop was the Martin Goodman Trail at the Woodbine Beach. I've been to this trail before the last time I inline skated with AK and I really enjoyed the newly-paved trail. I skated eastward to the end of the trail, turned back, skated west until I reached the Cherry Beach Park, turned back and skated until I returned to the starting point. It was a total of 14km and it took me about an hour to skate with brief rest stops in between. The weather was really hot and I was sweating like crazy but it was a good workout. After that, I went to Zane Patisserie to pick up some croissants and brioche for breakfast. Nothing like balancing my workout with butter-rich pastry, eh? I was starving by the time I got home so I ate some danish and croissant for brunch. After freshening up, I headed out the door again. I parked my car at the Finch station parking lot and took the TTC to Nathan Phillip Square for the 2nd annual Taste Of Thailand. The event was organized by the Thailand Tourist Association to promote the culture and tourism of Thailand so there were lots of booths selling Thai handicrafts in addition to many food booths. As expected, I made a beeline to the food booths to "check out the competition". Most of the stuff on offer were just standard fares except for one booth which called in a friend to make some really interesting dumplings. She had a steaming pot of water with a piece of muslin mounted over the mouth of the pot. 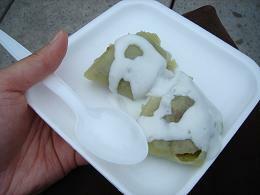 For each dumpling, she spreaded a ladle full of pandan-scented batter over the muslin. Once the batter is cooked by the steam into a delicate wrapping, she put a spoonful of grounded meat filling in the middle and wrapped it up using a few swift strokes. Each dumpling was brushed with fish sauce and served with coconut milk. It was a mixture of salty and sweet that was simply delicious. I also had a dumpling of sticky rice wrapped in bamboo leaves. It was tasty as well. I walked back to Eaton Centre. Since there was less than an hour before the stores would close for the day, I took a brief air-conditioned break (i.e. shopping). It was the end of summer sale and there were some great deals to be had. I bought a bebe long-sleeve sweatshirt with zippers for 70% off its original price. By the time I was sufficiently cooled down, I took the TTC to the Salsa On St Clair street festival that celebrates the Latin American culture in Toronto. Although Toronto is probably one of the most multicultural cities in the world, we do not have a prominent presence of latin american culture. I was lured to the festival by the promise of authentic latin american street food. I must say I was not disappointed. I had a Chilean empanada filled with ground beef, onions, and black olives that was absolutely delicious. I also had the El Salvador specialty pupusa which is a cornmeal pancake filled with grounded meat. For dessert, I had a dulce de leche popsicle. There were so many other things that I wanted to sample but I was already full. I guess I just have to wait for my next chance to try the fried plantain, churros, soft tacos, and all sorts of interesting-looking platters. Oh yeah, in between mouthful of food, I also caught some salsa dance performances, spanish-rapping, and mariachi music too. What a day! My feet are so tired. Better rest up for another day of inline-skating tomorrow. It's 35 degrees Celius in Toronto today and I unwisely ignored advice to stay indoor. After work, I went to our weekly softball game as usual. During warm-up, A gave me lots of useful tips on catching while S gave me a brief tutorial on throwing. I'm not athletically coordinated and I'm the first one to admit it. When S tried to explain to me how the flick of the wrist in a throw is similar to throwing things when I was a kid, I just had to laugh. This analogy immediately brought to mind when J taught me how to skip stones a couple of weeks ago. Again, the emphasis was on the flick of the wrist and full extension of the arm. Unfortunately, my poor ability in coordination only resulted in many pathetic attempts at chucking the stones barely to the edge of the lake. Good thing that J was very patient with me. For some strange reasons, I think my practice in skipping stones actually helped me to understand throwing softball. The knowledge must have (finally) sunk in over the last two weeks. After the game, I decided to go rollerblading at lakeshore. I parked my car near the Sunnyside Pavillion and rollerbladed at a slightly faster speed than I normally would. Stroking with my left leg is still not quite well but I think my technique has improved (longer and more powerful strides). 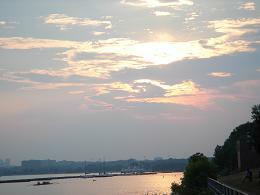 When I was catching my breathe, I managed to snap a couple of pictures of the sunset. It really was quite beautiful. I've had quite a bit of fun with making sorbet since the summer began but lately my interest has shifted to the lighter granita as the temperature rises. So far, I've made three batches of different flavours and I'm quite happy with the results. Of the three batches, my favourite is Jasmine & Lime but I think the watermelon is the most refreshing. I would love to try making a coffee granita and an earl grey tea granita soon!